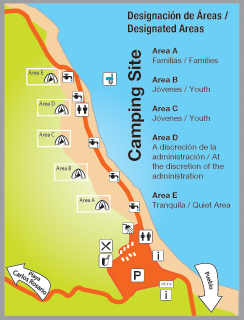 When you decide to camp, you’ll see you have to reserve and pay for your site in the office located at the entrance of the beach ($20 per night/per tent of a max of 6 people). They will provide a list of the campground’s rules. Always have the receipt at hand. ​Bring insect repellent and sunblock. ​Does this really need an explanation? Don’t miss out on the opportunity of adventuring around Flamenco or hiking up to Carlos Rosario Beach. This is an excellent way of keeping all the sand out of your tent. Leave the broomstick so it’s easier to pack. Keeping hydrated is very important, especially if you’re spending a whole day in the beach or drinking alcoholic beverages. Part of camping’s appeal is appreciating nature, like the moon and stars, but the twinkling stars won’t help you find something inside your backpack or your friend who went for a walk and hasn’t come back yet. No one wants to camp where it’s dirty. Although there are more than enough trash cans, it’s a good idea to bring bags so you don’t have to walk to them every time you want to throw something away. Help keep the campground clean. veryone always forgets something. If your tent neighbor asks to borrow something, lend it to him. Chances are, you’ll need something of his later on. ​It’s not necessary to pack your entire closet for a camping trip. Bring only the essentials. Remember to bring cash. The last and most important tip, submitted by our reader Juan C. Gaztambide, is “be patient”. Be patient with your tent neighbors, with the campground staff, with the kiosk employee and, especially, be patient “[with your friends] so you don’t end up fighting after three long days together.” We hope these tips help you on your next camping trip to Flamenco.